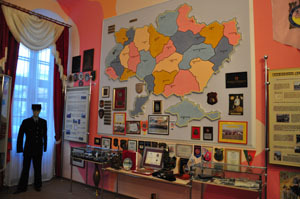 The first room shows the history of the University building. It was built in the middle of 19th century by the order of the Austro - Hungarian Emperor Franz - Joseph with the assistance of his Adjutant General - Count Gruner. On February 28, 1851 while Franz - Joseph visited Lviv, the representatives of the city requested him to build a special house for disabled militarians from Galicia and to produce them a decent life in their own land. The emperor granted the request and ordered famous architect Theophilus Hansen to make the project. He also granted Zł 700, 000. For the construction of the monumental complex with a chapel the city authorities (due to proposal from Karol Hoepflinhen-Berhendorf – the mayor of the city) chose a plot of land on the Pilihovskyi manor (now Kleparivska Street, 35). А special meeting was convened and referred urban area together with an oak forest was donated. Also a municipal brickyard was given for free using. In 1939-1941 western and eastern regions of Ukraine were reunificated. At that time Regiment #233 subordinated to People's Commissariat for Internal Affairs (NKVD) was quartered in the building (military unit #7480). The building was not damaged during World War II so on August 10, 1944 military unit #7480 was quartered there again. By the decision of the Ministry of Internal Affairs (May 1954) Kiev Fire-Technical School was redeployed to Lviv and placed in the building. Later it was renamed as Lviv Fire-technical School of MIA of USSR. The hall also describes the history of the Virgin of Mercy Church, which is a part of the architectural ensemble of the building. The architect Theophil Hansen designed it as a Greek cross inscribed in a square. The chapel was built between 1855 and 1863 years in conjunction with the main building. After 1939 the building of the chapel underwent destruction and was used for other purposes – as a clothing warehouse. Only in 1993 Rector of the College Colonel of internal service Bohdan Grytsay took the initiative to remove the warehouse to another location and to restore the chapel. 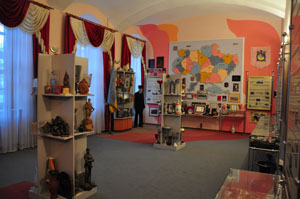 The second room is devoted to the origins, formation and development of the institution. In October 1947 at the first Noncommissioned Officer Academy of MIA of USSR Fire Protection Officers Courses were established. The training time was 10 months (for inspectors) and 15 months (for commanders of branches). On April 18, 1948 the Courses got a Battle Flag and on May 8, 1948 the personnel was brought to the military oath. The first graduation of 46 students took place in January 1949. This year the number of students was increased to 100 people with the training time of 11 months. In July 1951 the profile of training was changed and the Courses were renamed as Kiev Training Courses for Military Fire-Fighting Officers. On July 22, 1952 MIA of USSR ordered to establish Kiev Fire-Technical School with 344 people of permanent staff and 840 students. That was an important historical landmark. From May 4 till May 10, 1954 Kiev Fire-Technical School was redeployed to Lviv. It was renamed as Lviv Fire-Technical School of MIA of USSR. In 1959 the structure of the School was amended – the political department was eliminated; in 1960 22 officers and 6 sergeants were transferred to the category of employees. In 1966 the School was subordinated to the Ministry of Public Order of USSR. In 1991 Declaration of Independence of Ukraine was adopted. It was the turning point in the life of the whole state and of the School in particular. On July 31, 1991 the School was subordinated to MIA of Ukraine. In 1993 academic staff initiated teaching of all subjects in Ukrainian. In 1994 a training center was built in the Tsuniv village (Horodok district). There all the freshmen have their basic training.. In 1995 the School got from Lviv Regional Administration a new flag with the Ukrainian symbols. One more important event happened on June 21, 2001: Lviv Fire-Technical School of MIA of Ukraine was reorganized to Lviv Institute of Fire Safety of Ukraine according to Order of the Cabinet of Ministers. On January 27, 2003 the Institute was subordinated to the Ministry of Extraordinary Situations and Population Protection from the Consequences of Chornobyl Disaster according to the Decree of the President of Ukraine. With a focus on qualitative training of professionals for MES Departments, pursuing the aim to join the European Bologna Educational Standards on March 29, 2006 Lviv Institute of Fire Safety of MES of Ukraine was reorganized to Lviv State University of Life Safety. On June 1, 2009 the University became a member of the European Fire Service Colleges’ Association (EFSCA). In the room # 2 different patterns of military uniforms from different periods are exhibited. 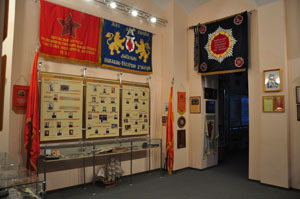 The visitors can also see 4 flags as symbols of different stages of the University history. Room #3 shows the visitors the main directions of development of the University such as infrastructure, research facilities, educational process, practical training, culture-into-masses work, sports and mass activities, international activities and performance of public tasks. In 1985 the School territory was redeveloped. In a short time sports complex, educational fire and rescue unit, smoke and heat training facility were built. In 2001, according to the Law of Ukraine "On Education", The Academic Board was created. Rector of the Institute Colonel of internal service Mykhailo Kozyar became the first Head of the Academic Board. The educational activity is based on current legislation, orders and instructions of SES of Ukraine. At the core concepts of cadets and students personality formation are based on patriotism and humanity. University took part in the performance of mane public tasks. From 19 June till 9 August 1980 as a part of a separate battalion 459 people provided fire safety facilities during the XXII Olympic Games in Moscow and Tallinn (where the regatta was held). For exemplary performance the School was awarded the Diploma by the Presidium of the Supreme Soviet and the Diploma by the Olympic Games Organizing Committee. On February 21, 1989 the personnel of the School took part in the assignment of public order in Mountainous Karabagh. Specific objectives were also put on our educational institutions during Pope's John Paul II visit to Lviv on June 25-27, 2001. Culture-into-masses work first of all is performed by our wind-band which often participates in different national and international activities. Honored Worker of Culture Yaroslav Slyva together with Vasyl Kreshchyshyn composed "Fireman March", which became the anthem of our institution. Our artist Tkachenko S. A. also played a significant role in the culture-into-masses work. His works are repeatedly exhibited in various galleries. Our team of amateur talent activities has participated in dlfferent competitions and has won many awards. Our institution has significant sport achievements. All of them are displayed in the Museum. Since its relocation to Lviv our teams have participated in many competitions (weight-lifting, shooting, swimming, officer triathlon, sambo, martial arts, fire-fighting applied sport and others). A special corner is dedicated to international collaboration. Currently LSULS cooperates with 14 countries, and provides training our cadets abroad. The first step of international cooperation was done by Mykhailo Kozyar whose initiative allowed our cadets training in France and Poland. 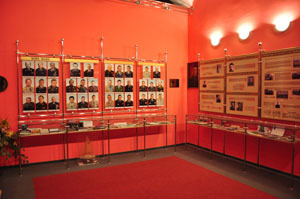 The last room is dedicated to Chornobyl Heroes and graduates that are our pride. Those people made heroic deeds and were awarded with state decorations. Professional training of highly qualified specialists remains the main prerogative of our institution. Throughout its existence our institution has trained more than 30 thousand professionals. Our graduates adequately multiply glorious traditions of their native alma mater. Today many of them take leading positions in departments and units of SES of Ukraine and ex-USSR countries. 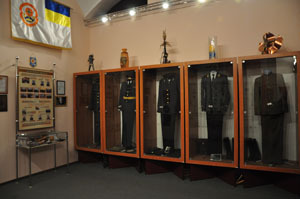 The museum became a center of educational work for cadets and students, it uplifts humanity and the spirit of patriotism.